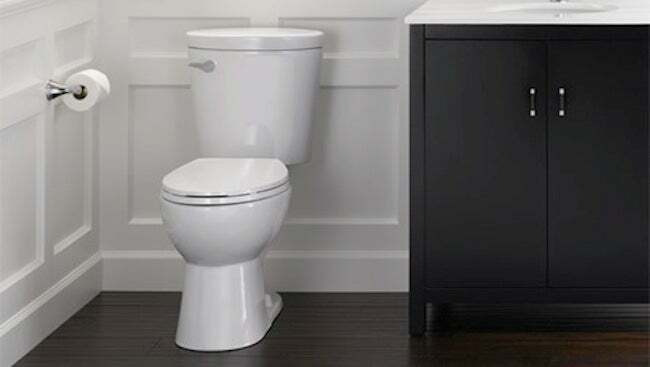 While the mechanics of a toilet are pretty basic, there are several factors to consider when it's time to shop for a new one, says HGTV's "Elbow Room" host, Chip Wade. “With subtle style differences and various makes and models available, a toilet is a pretty simple machine designed to do a pretty basic job,” says Chip Wade, professional contractor and host of HGTV’s Elbow Room. They’re cast and coated with a porcelain protective finish. They have a tank and a bowl and a flush valve that—when pressed—lifts a flapper that fills the bowl with water and siphons the contents down the drain. Other than clogs, cracks, mishaps, and loose fittings, they perform their job without notice. End of story! “But despite the straight-forward design and mechanics, not all toilets are created equal,” says Wade. If you’re in the market for a new one, here are some things to take into consideration to make sure that the product that you choose and install is the best one for the job. The average seat height of the standard commode is roughly 15 inches from the floor to the top of the seat. Comfort height, sometimes referred to as ADA Compliant Height, toilets have become increasingly popular in the last several years, in part because the higher seat makes them easier for the elderly to use. They measure between 17 and 19 inches from the floor, a distance more comparable to standard chair height. While seat height is clearly a personal decision, notes Wade, having a comfort height toilet in the bathroom may be a selling point for a future buyer. Toilet bowls come in essentially two shapes, round or elongated. Round bowls are usually less expensive and take up less space, measuring roughly two inches less than their elongated counterparts. “If you can fit it into your design, I recommend an elongated bowl,” says Wade. An elongated bowl provides more support and comfort, and as this is becoming the shape of choice, it will be easier to find a replacement seat should you need one. Toilets account for about 27 percent of the water used in the average home, according to the Environmental Protection Agency’s WaterSense program, with some models—depending on age—using between three and seven gallons per flush. By law, new toilets can’t use more than 1.6 gallons of water per flush, so if you have an old toilet, replacing it will be not only a decorative improvement, but a cost-saving one as well. “Good performance is key when it comes to toilets,” says Wade, “so look for products that are manufactured by well-known brands and that carry the WaterSense® label,” which indicates that they use 20 percent less water than the standard now required by law. 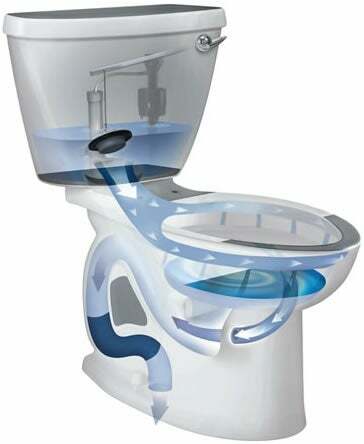 Even if you choose the best toilet on the market, its performance will be compromised if it is not properly installed. “You’ll want to make sure that all external bowl and tank connections are tight and secure, that the flush valve and flapper are installed and functioning properly, and that the water supply line and fill valve are connected, tight, and leak-free,” says Wade. Newcomers to the category, like the Delta toilets that feature SmartFit™ Tank-to-Bowl Connection, make installation even easier for the do-it-yourselfer. The design uses a metal bracket mounted on the underside of the tank to secure the three anchoring bolts snugly to the bowl. By eliminating the holes typically found in the bottom of the tank for this purpose, the new Delta toilet reduces potential leak points—and the cracks often caused by overtightening. 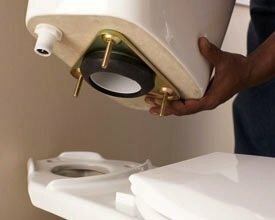 The toilet comes boxed with everything needed for installation—from tank, bowl, and seat, to mounting hardware, tools, and wax ring—making it a smart homeowner replacement buy.